Let's start things off by going through some IDP news, notes, and commentary from Week 6 of the NFL season. J.J. Watt owners were left in a bewildered state after he failed to register anything in the box scores this week. This was the first time since his rookie season that he was held without a tackle. There's nothing in particular to point out about this situation except the Texans' defense was only on the field for a mere 42 plays. Opposing offenses always gameplan specifically for Watt in an attempt to take him out of the game, it just happened to work this time. I fully expect him to come back with a vengeance next week against Kansas City. Rookie Alec Ogletree continued his impressive start to the season with a 10 tackle, forced fumble, and INT for a TD performance against the Texans last week. However, he was still out shadowed by DROY frontrunner Kiko Alonso who had a combined 22 tackles. Granted, the home scorekeeper was fairly generous with his issuing of assists for Alonso, but he's a very instinctive player on a defense with consistent top 5 tackle opportunity, so this is no fluke. For those of you who read my articles on a weekly basis, you will know that I touted A.J. Hawk as my top waiver wire pickup last week (I picked him up and started him in two leagues of my own). Well, he didn't disappoint with 8 solos, 2 assists, 3 sacks, and 5 tackles for loss. Continue to start Hawk with confidence for as long as Brad Jones is out. Jerod Mayo underwent surgery to repair a torn pectoral muscle and is not expected to return this season. It's a striking blow for a Patriots defense that has already lost Vince Wilfork up the middle. Jerrell Freeman suffered a concussion on Monday Night Football. Mario Harvey came in as his replacement and racked up 10 tackles on 35 snaps. Despite the high tackle per snap rate, Harvey looked sluggish and out of position on the majority of his plays and it would be a bit of a surprise to see him repeat that type of box score production next week if Freeman is out. DeMarcus Ware suffered a quad strain on Sunday Night Football and did not return. There have been conflicting reports on how many games he may have to sit out due to this injury. Although he's never missed a game, it's looking like anywhere from a one to four game absence. Converted linebacker Kyle Wilber will start in his place for the time being. Texans coach Gary Kubiak said Monday that safety Danieal Manning has a significant knee injury that will cause him to miss a considerable amount of time (6-8 weeks). The Texans will start Shiloh Keo in his place. A Monday MRI confirmed Titans MLB Moise Fokou's sprained knee is "nothing major" and according to the coaching staff, but he will miss Week 7. Colin McCarthy will start in his place against the 49ers this week. Although he should see 85%+ of the snaps, his inconsistency and diminished on the field play leaves him in the LB4 with upside tier. ESPN's Adam Schefter reported that doctors believe Cardinals RE Calais Campbell will be "sore but OK" after Sunday's Week 6 neck injury. Seahawks RE Chris Clemons is in danger of missing Week 7 due to a hyperextended elbow. Vikings FS Harrison Smith exited Sunday's game against the Panthers with a foot injury that the team is now calling a turf toe issue. He was seen in a walking boot on Monday and his status for Week 7 is up in the air. Desmond Bishop is done for the year with a torn ACL. Some combination of Marvin Mitchell and rookie Gerald Hodges will take those weak side snaps moving forward. 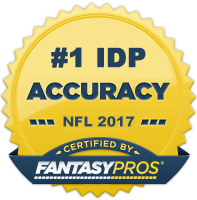 Now onto The Guru's IDP waiver wire selections for Week 7! RDE/RDT Darnell Dockett (ARZ) - Dockett has fallen off the fantasy radar of most after two sub-par seasons. However, he seems to be having a slight Renaissance as of late. He's been fairly decent in the tackle column (averaging nearly 3 solos per game) and has a 40%-50% chance for a sack this week against a struggling Seattle offensive line. He gets an added bump in leagues in which he can be utilized as a defensive tackle. DE/OLB Mike Neal (GB) - Despite laying a goose egg last week, I'm recommending Neal as a possible sleeper option for owners looking for a desperation DL3/DL4 play this week. He played 79% of the snaps last week (a good chunk will likely come at OLB) and has a fantastic matchup against Brandon Wheeden who holds on to the ball entirely too long. RDT Michael Brockers (STL) - After a slow start to the season, Brockers production has ramped up over his last three contests. During that span, he's pumped out 11 solo tackles, 1 forced fumble, and 3.5 sacks. The Panthers matchup is a solid one. He's slowly evolving into a viable low-end DT1/high-end DT2 in defensive tackle-required leagues. DE Wallace Gilberry (CIN) - With the injury to starting right defensive end Michael Johnson, Gilberry has been called upon to step up and play more often and has made the most of that opportunity. Over the last two games, he's posted 8 solo tackles, 1 assist, 1 forced fumble, and 3 sacks. He's only going to play in passing situations (50% of the time), but there's a good chance that snap count increases against the pass happy Lions this week. I will caveat by saying the Lions have been the 2nd toughest team to sack so far this season, which ultimately makes Gilberry more of a solid DL4/desperation DL3 play. MLB Jon Beason (NYG) - Although it was expected that Beason would be integrated into the defense quickly, it was a bit of a surprise to see him start, let alone put up 12 tackles (11 solo), against the Bears on Thursday Night Football. Granted, Chicago's offensive style favors a player like Beason, but he played in 93% of the team's snaps and is on a "target rich" defense with VERY little tackle competition in the front seven. He's not a shoe-in to be the leading tackler every week, but variance withstanding, he's worth a look as an LB3 in most leagues. SLB Von Miller (DEN) - This is a reminder more than anything else. Miller is coming off his six week suspension and can now be inserted back in your starting lineup. With the Broncos expected to have large leads in the majority of their games, Miller should be able to pick up right where he left off last season. LB1 in big play leagues and LB2- in balanced scoring systems. MLB Jon Bostic (CHI) - With D.J. Williams done for the year with a torn pectoral muscle, Bostic will finally get the opportunity to see starter snaps after a very strong pre-season. He's going to leave the field in nickel situations, but his above average run-stopping abilities between the tackles should allow him LB3- value in the right matchup situations (i.e. against teams that pound the ball and don't utilize a lot of spread formations). ILB Brandon Spikes (NE) - The potentially season-ending injury to Jerod Mayo will definitely have ripple-down effects for the entire New England defense. It's a bit unclear to which linebacker (if anyone) will assume an every down role. However, judging by historical precedent, Brandon Spikes looks to be the first in line to receive a significant size increase in value. The Patriots play the Jets this week, so Spikes will likely play nearly every down regardless, making him a solid LB3 choice in 10 and 12 team leagues. SS Jamarca Sanford (MIN) - Sanford has flown under the radar in the majority of leagues as he's not a household name (even in the IDP world) and has missed 2 games due to injury. However, in the three games he's played, he's posted stat lines of 7-2, 8-0, and 7-1. With Harrison Smith potentially missing some time with a turf toe injury and an above average matchup for DBs in the Giants, now is a good time to slide Sanford on your rosters and use him as a DB3 if you are looking for help at the position. SS T.J. Ward (CLE) - Outside of his impressive rookie campaign, Ward had been fairly pedestrian over the last two seasons from a fantasy perspective. However, the tides seem to be changing with the arrival of defensive coordinator Ray Horton and his aggressive attacking style of coaching and playcalling. Ward is averaging 6 total tackles per game and has 2 INTs so far this season. With their receiving core decimated and the Browns being extra stout against the run, expect the Packers to attack the middle of the field using Jermichael Finley in this week's contest, giving Ward a good amount of tackle opportunity. He's a strong DB3 play. SS Quintin Mikell/FS Mike Mitchell - Both Mikell and Mitchell (has a nice ring to it) played well last week. Mikell has been a solid producer for us throughout his career and Mitchell is a player owners in deeper leagues have been waiting to emerge. Both players' ceilings are a bit limited playing behind Carolina's strong front seven, but for those in deep leagues, they are worth a look as a DB3-/DB4+. CB Marcus Cooper (KC) - Cooper, a 7th round draft pick this season, has been vaulted into the starting lineup in replacement of an injured Brandon Flowers. He's had an interception in back-to-back games and had 5 solo tackles last week. If Flowers is out again this week, Cooper becomes a solid CB2+ play against the Texans who are currently giving up the 2nd most points to cornerbacks. Expect the rookie corner rule to be in full effect and Cooper to be busy.